Egyptian composer, singer and oud player Shady Moanes is finalising his first album Tufranil with music producer Rafik Adly, releasing its first single, Kelmteen LeMasr (Two Words For Egypt), on Friday, marking the eighth anniversary of the 25 January revolution. "This song is a new composition of mine for a well-known poem written by the great Ahmed Fouad Negm. It really symbolises pure love for the country and I can't think of a better day to release it than 25 January, as that is the day when Egyptians united to announce their love for Egypt," Moanes told Ahram Online while finalising the album's sound mixing with Adly at One Take studio in Nasr City. The co-founder of Eskendrella band will release his six-song album for free streaming on various internet and social media platforms such as Facebook, YouTube, Soundcloud and Anghamy. Kelmteen LeMasr was originally composed by Sheikh Imam and is presented with a modern arrangement as well as a new composition that is quite different from the original. "Negm, God bless his soul, heard my composition for 'Kelmteen LeMasr' years ago and told me that it was the first time he had heard it visualised with music like this," Moanes revealed. 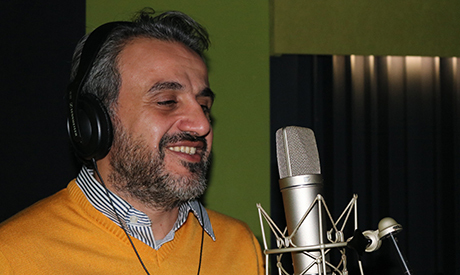 The Bait El-Oud graduate has chosen for his album poems by giants like Negm and Bahaa Jaheen, as well as contemporary poets like Micheal Adel, Montaser Hegzy, and Mostafa Ibrahim. "People know these lyrics very well. These poets are the best. I am so proud to introduce my compositions of their lyrics in a well-made arrangement, thanks to Adly, who helped me a lot and worked very hard to finalise the album," he said. Tufranil features Hekayat Band's young female vocalist Nadine Amer as the lead singer of Fataht Bab El-Hawa, and Dina Salem in Kol Ma Tigy, accompanied by Omar El-Sakka, Nouran Adly, and Reda Shiha's choir trio. Among the musicians who play on the album are Mohamed Atef (ney), Beshoy Shenouda (accordion), Ayman Mabrouk (percussion) and Sherif Saeed (guitar). The strings section is composed by Hisham Mostafa. "I am so delighted to work with such a great team of musicians. They did a great job that I am hoping the listeners will appreciate it as well," he said. "I will release a single every one or two weeks. The album will not be on CD for many reasons. The main reason is that the censorship authorities surprisingly didn't approve of many of the lyrics," he said. According to Moanes, the censorship authorities rejected three of his songs, including Bahaa Jaheen's, because of some of the slang words in the lyrics, such as the words 'olla' (meaning 'clay jar') and 'molla' (bed slats). "As long as there is censorship, there will be no art," said Adly. The music producer spoke highly of his experience collaborating with Moanes, describing his album as "very different." 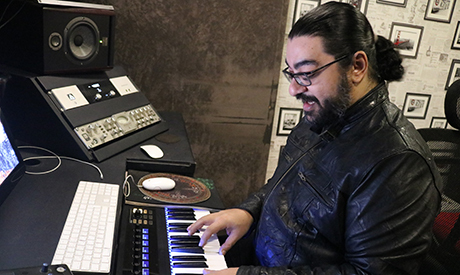 Moanes, accompanied by Hekayat Band, will perform tracks from his new album on 14 March at the American University's Falaky Theatre in Downtown Cairo in a release concert that will feature many of the musicians featured on the album. Founded by Moanes in 2009, Hekayat Band, who are known for their oriental covers of Sayed Darwish and Sheikh Imam, have given a series of successful performances at various venues in Cairo, including the British Council and the Egyptian Museum.